This article first appeared in The Edge Financial Daily, on October 26, 2017. (From left) So, Musa, Korda, Abdul Ghani and LPGA Commissioner Michael Whan Bio at the LPGA Pro-Am at TPC Kuala Lumpur. Korda in action at the LPGA Pro-Am at TPC Kuala Lumpur. Mi-jung Hur (left) and The Edge Communications publisher and group chief executive officer (CEO) Ho Kay Tat at the LPGA Pro-Am at TPC Kuala Lumpur. (From left) The Star executive editor Brian Martin, Hur, Ho and Prolintas Group of Companies Group CEO Datuk Mohammad Azlan Abdullah at the LPGA Pro-Am at TPC Kuala Lumpur. 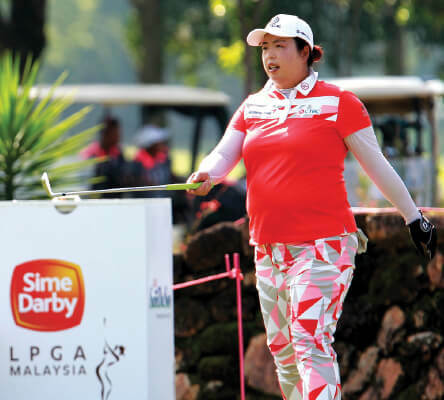 Shanshan Feng in action at the LPGA Pro-Am at TPC Kuala Lumpur. KUALA LUMPUR: After a day of press conferences and photo-calls, the action shifted to the fairways and putting greens of TPC Kuala Lumpur yesterday, as the eighth edition of the Sime Darby LPGA Malaysia got underway with the traditional pre-tournament Pro-Am. Dignitaries, sponsors and VIP guests had the opportunity to play alongside the stars of the LPGA Tour who are in town to compete in the US$1.8 million (RM7.63 million) purse showpiece event. Played according to the Stableford handicap system, the morning Pro-Am saw Yayasan Sime Darby chairman Tun Musa Hitam teeing off alongside world No 1 So Yeon Ryu of South Korea, while chairman of the Sime Darby Board Tan Sri Abdul Ghani Othman headed off down the first fairway with playing partner and 2015 tournament winner, Jessica Korda of the US. The 27-team competition was won by the Sime Darby Plantation team featuring LPGA player Gerina Piller of the US, playing alongside Datuk Nageeb Wahab, Datuk Hamdan Salim and Adi Wira Abd Razak. The tournament proper gets underway today when 78 players — including eight Malaysian nationals led by LPGA Tour player Kelly Tan — will test themselves over 72 holes of stroke play to see who walks away with the winner’s trophy and a cheque for US$270,000 on Sunday.